Another vessel suspected of carrying N. Korean coal found. August. 08, 2018 07:15. best@donga.com,lightee@donga.com. 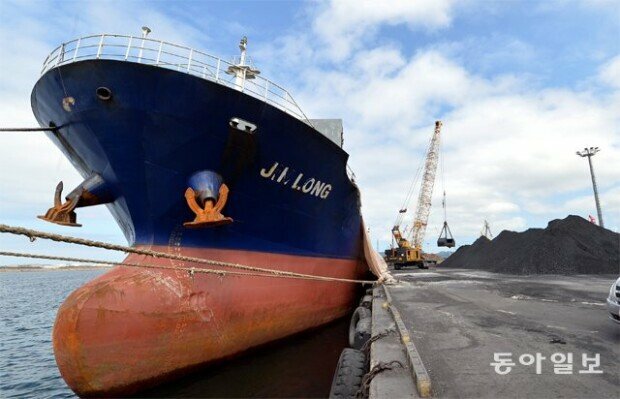 An official from a shipping service agency that was in charge of the management of the Jin Long’s entry and departure said that the ship “carrying 5,100 tons of North Korean coal entered the Pohang port at 7:30 a.m. Saturday and unloaded the coal,” in a phone call with The Dong-A Ilbo Tuesday. The Jin Long is one of the three ships reported to have carried North Korean coal, together with the Sky Angel and Rich Glory. “The coal in the Jin Long was marked as Russian, and the ship passed through customs after submitting a certificate of origin,” said the official. The Jin Long was initially scheduled to depart at 11 p.m. Wednesday, but as its entry into Pohang and dropping off of coal were made public through the report of the Voice of America, U.S. government-funded radio broadcast source, the vessel changed its schedule and left for Russia in the afternoon without clear reasons. It has not been officially confirmed whether the Jin Long has always shipped North Korean coal since it was first suspected of having carried coal from Pyongyang on Oct. 27 last year. However, circumstantial evidence includes a testimony that the North has exported its coal by disguising it as Russian coal. A Radio Free Asia report cited a person from North Pyongan Province working in trade as saying that there is a Russian company that fudges documents to disguise the North Korean coal shipped to the ports of Nakhodka and Vladivostok as its own. The Russian company charged two dollars per ton for forging documents, and the fee was paid by a North Korean company immediately after exports.